​2018 has come to an end, and it was a pretty great year for me. But I wanted to start off by saying that it was a sad year for the Marvel fans as the comic legend, Stan Lee, have passed away. RIP Stan Lee, without you, there will be no Marvel of today. You and your cameos will be missed! Excelsior!! ​Now to the fun stuff, one of my art creation, the Zodiac series, based on characters from Disney, Marvel and Star Wars, has been featured in the Taiwanese website "EBCBUZZ". I was so happy that my designs has gain interest from over seas. Being an introvert and having social anxiety, I seldom promote my artwork publicly. So for someone to discover my artwork and shared it has gave me great pleasure. And I hope my most favorite series, the “Luminous Series”, will get some attention some day as well. I finally got a chance to visit Europe. I am a big Mozart fan, and Vienna has always been on my places to-go list, because Vienna is the city of Musicians. I am so glad that I was able to visit Mozart's home in Vienna and Salzburg. Another place on my list is Greece. I've always been fascinated by Greek mythology since I was a kid, and really enjoyed watching movies with stories about the Greek Pantheon, and I'm also dying to see the beautiful blue Aegean sea! So this is really a dream come true to me. Oh and of course, Disneyland de Paris! can't miss that one! One more Disneyland (Shanghai) and I will have gone to all Disneyland around the world! Yay!! Last but not least, I am fortunate to have the opportunity to visit the Pixar Animation Studios and attended the special screening of ”Incredibles 2” at their studio theater, even before the world premiere. It was such a treat. I also had the opportunity to tour the Walt Disney Animation Studios and attended a special screening of ”Ralph Breaks the Internet”! During the tour, I was escorted through the hallways of the studio, which was filled with artworks by many Disney artists. It was very inspirational and I never thought that I would be so lucky to have the chance to visit the studio since they were usually not open to the public before, but who knew right? Guess that's the Disney Magic! ​Looking forward to another wonderful year! Happy New Year! Cheers! So to summarize the positive and negative events of 2015, I can tell you that it was a roller coaster ride. Starting off the year, I was so delighted to have met my idol, the Disney Legend, Master Animator, and creator of Ariel, Glen Keane! To hear him giving a speech in person was very encouraging and also very emotional for me. I grew up with Ariel and it was this character that inspired me to draw and sing. The first song I learned to sing was Part of Your World. This character meant so much to me, and it was created and drawn by Glen Keane. Earlier this year, I had the opportunity to meet Glen Keane and it was such an inspirational moment. Already having met the writers, directors and producers of the Little Mermaid, Ron Clements and John Musker, at the Walt Disney Studios last year, and also Alan Menken and Jodi Benson before that, I felt that I’m a lucky girl to have been able to meet the whole team of my favorite childhood animation. I guess this is the Disney Magic (Dream, Wish & Believe). ​In March, I was excited to be invited to the Walt Disney Company’s 2015 Annual Meeting. It was a unique and fun experience and not as boring as I thought it would be. Mickey Mouse was there to greet us along with Olaf, Storm Troopers and more! After the meeting, we were all treated to an early screening of Cinderella. It was a wonderful experience. I loved animation and that’s how I started to draw. But unfortunately, I did not have the chance to study animation when I was young and settled for graphic design in college. I stopped drawing for a while and was working in the music industry. I felt that during this time, my art skill has deteriorated, and I’m always hesitant to present my artwork to great Disney artist because I felt that my art skills are not up to the quality of their standards. But thanks to my hubby, he gave a set of my Allure Series artwork to a Disney Artist, Mike Peraza, and received positive comments. This gave me confidence to help me continue to do what I like to do. I am now continuing to draw and also working on my new style of artwork. I don’t quite have a name for this style yet, but as some of you may have seen, it’s basically artwork with black background with high contrast colors and lighting effects. merchandise was very hard to come by. There was a D23 exclusive Pixar shirt that I really really wanted to get, but was not able to because of the many scalpers purchasing all of them and putting it on eBay for 3x the amount of the original price. I was down for a few days. But overall, it was still a fun expo and this year was definitely a new experience for me. This year was the 60th Anniversary of Disneyland and also the Diamond Celebration. I had high hopes for my visit this year, and with high hopes came with disappointing moments. Started the day with a bad experience at the parking garage. There was some accident earlier in the day and we were directed to make a detour to a different nearby parking garage which was a little further away and with all the commotions, we finally arrived at the gate almost an hour later. Then at the entrance where we were stuck for a long time. There was a malfunction of the ticketing machine and instead of directing us to the next line, the cast member just sat there waiting for the manager to come help without letting the rest of the line know about what’s happening and how long it would take. So we ask if we can just go to the next line and she said that we will have to go to the end of the line, which doesn’t make sense as we were already in line for a long time. So we waited and waited and finally another cast member came and we were let through. So with that out of the way, the rest of the day was great and fun… until… the fireworks. We were already excited to be in Disneyland and was waiting for the finale before we head home, the Diamond Celebration fireworks! But to our great disappointment, the fireworks had some technical difficulty and was cancelled. But we were told that it was cancelled due to high winds! High winds!!! We looked around, none of the leaves were even moving… it was a calm day all day long. But I guess Disney didn’t want people to know that they had technical difficulties. Oh well… it was just disappointing and it wasn’t the happiest place on earth for me this time. Even though it wasn’t the best experience, but the force of the Disney Magic will bring me back to Disneyland again in the near future. Looking forward to the new year of 2016 and wish everyone a Happy New Year! Cheers! Time flies... today is the last day of the year 2013. Thinking back on what I have done this year, there were happy times, down times but overall, it was still a good year. Let's start off with the not so good stuff first. My crowd funding indiegogo campaign was not successful, I didn't raise the amount that I needed to create my album. But that's okay, just like what Walt Disney said, "It's good to have a hard failure when you're young". So with the little amount that I received, I was able to create a demo album. This also gave me time to relax a bit so I have time to continue with my art interest. I began to draw again, and have learn how to do it digitally. I created my own style of Disney inspired artworks, the "Origami" and "Allure" Series. I never would have thought that I would return to doing art. And this time, it's Disney inspired art, the subject that most interest me. Being able to provide my artwork for sale also encourage me to do more. Knowing that someone somewhere in this world appreciate my artwork and purchase a phone case with it, carrying it with them everyday makes me smile with glee. But I will not stop doing traditional art as that is my first true passion. During the year, I attended the GGDC spring meeting in which I donated one of my artwork for the club to use as a raffle. To my surprise, I was excitedly happy to see that my artwork had one of the most tickets being used to hopefully win that piece. 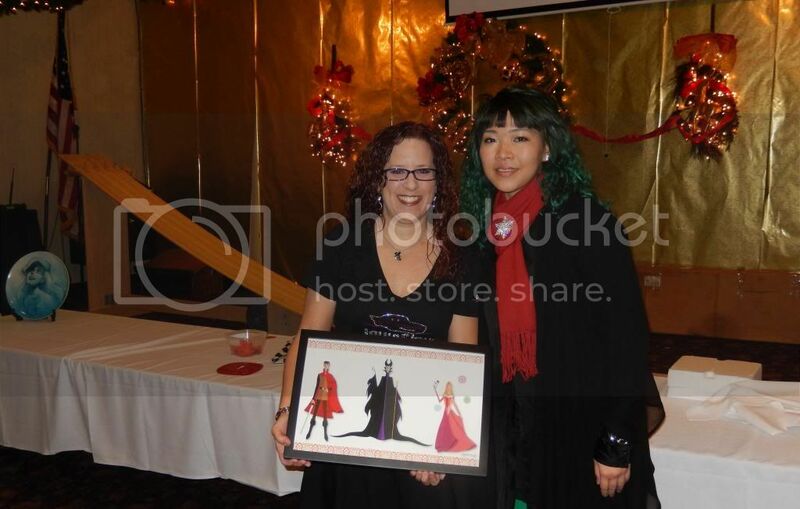 Again during the GGDC Xmas party, I donated another piece to the club as a raffle prize. Once again, my artwork had one of the most tickets placed in the bowl. Here is a photo of the winner of my artwork. I never thought that my artwork would be appreciated so much and this have really encourage me to continue on what I love. This year I had the honor to meet a few talented Disney artist and Legends. They are but not limited to, Tyrus Wong, Andreas Deja, and Claire Keane. But I hope in 2014 I can also meet Claire's father, Glen Keane. He have inspired me the most ever since I was little. I have learn so much from listening to these artist during their workshops and talks. They inspired me even more to create more good artworks. Traveling... although I haven't done too much traveling this year, but I did made one spectacular trip. 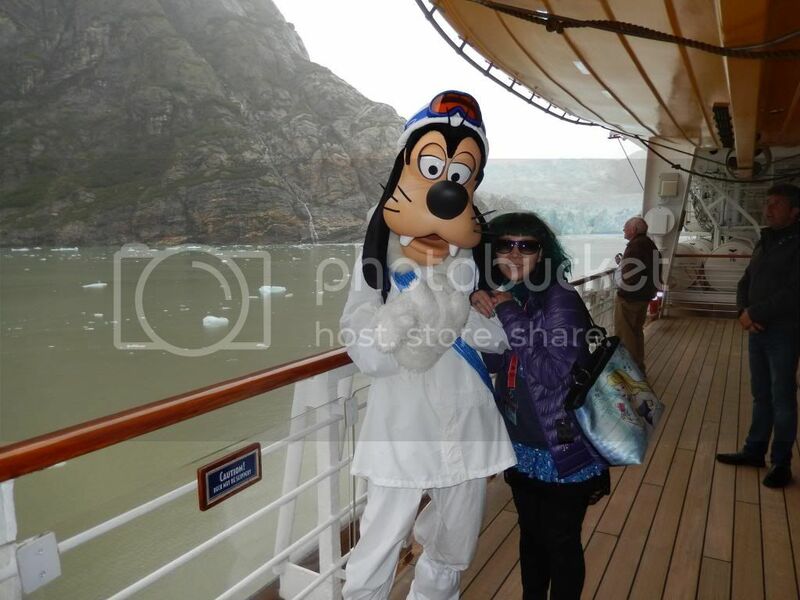 I went on an Alaskan Cruise with the Disney Cruise Line! It was the most fascinating places that I have been too. The glaciers were majestically beautiful. I rode a helicopter and then a float plane. The Alaskan Huskies were so cute. The food were great. The King crab legs were delicious. The scenery is just breath taking. I'd go there again in a heart beat. One sad moment this year was the passing of Walt Disney's daughter, Diane Disney Miller. She was such a nice and humble lady and have contributed so much to promote Walt Disney's Legacy. I'm so honored to have meet this wonderful lady and hope that she enjoyed the CD that I have recorded for her. Without Diane, I wouldn't have been able to perform at the Walt Disney Family Museum. Her passing was such a shock to me but she will always be in my heart, just like Walt Disney. I hope I will have another magical year in 2014!